Why to invest in properties in Lithuania? Many of those who are planning to buy property in Europe consider not only its central part, but also the Baltic. Indeed, why pay a lot of money as cheap properties in Lithuania are no worse, and often better than, for example, Czech realty, in terms of cost and in terms of long-term perspective. The mild climate, good environment, excellent resorts and all opportunities for more than civilized, low cost living and doing business - Lithuania's attractiveness to home buyers is obvious. There are two types of owners of real estate in Latvia - those who seek a higher, European standard of living and those who care about their health. The environmental situation in the country more than favorable and the climate is cool. 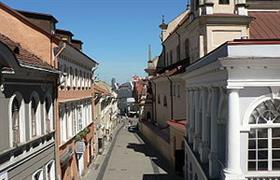 Therefore, among buyers of flats, houses or villas in Lithuania are many retirees and young families with children. And if to affordable housing prices in Latvia will be added the fact that the country has an abundance of pristine lakes, national parks, as well as the sea, it is not surprising why the number of buyers from abroad is constantly growing. Klaipeda - is one of the most attractive cities and real estate markets in the country. It is one of the most important seaports and the third largest in Lithuania, which is also the most popular tourist destination in the country. Flats and houses in Klaipeda and in the quiet and comfortable balneological center of Palanga are in high demand among buyers and tenants who prefer to spend their holidays in these Lithuanian cities, saving on the noisy hotels. How can a foreigner buy property in Lithuania? Foreigners are allowed to purchase lodging on the sea, houses in the countryside or any property in Lithuania. Local legislation does not have any strict limitations and requirements to non-residents. In order to conclude a real estate transaction you need to provide a valid passport and have the necessary amount. Moreover, the registration of the transaction took only three days, and pay for the object can be made either by bank transfer or in cash.